The legendary R&B group are set to perform a host of dates in the UK this Spring, including a performance at Chelsea’s Under The Bridge. The iconic soul group Chairmen of the Board are to embark on a rare, six-date UK tour this Spring, performing shows in London, Chelmsford, Manchester, Southampton, Sheffield and Dudley. The group, famous for hits such as ‘Give Me Just A Little More Time’, ‘You’ve Got Me Dangling on a String’ and ‘Finder’s Keepers‘ , today consists of bandleader Ken Knox, along with Thomas Hunter and Brandon Stevens, and their six piece band dubbed ‘The Executives’. Providing support will be the UK’s own Northern Soul band, The Signatures. Chairmen of the Board featuring Ken Knox are set to play Under The Bridge in Chelsea this April. Formed in Detroit by lead singer General Johnson, the group were the first act signed to the Invictus record label founded by the legendary songwriting-producing trio of Holland-Dozier-Holland, better known as H-D-H. When H-D-H left Motown Records after a dispute over royalty rates, the trio struck off on their own, forming the Invictus and Hot Wax labels. They assembled General Johnson, Eddie Custis, Danny Woods and Harrison Kennedy as the Chairmen of the Board, and became their company’s flagship act. The quartet would become a trio when Custis quit after recording two albums with the group. Undettered, the group continued and in 1969 they had a million seller record with ‘Give Me Just a Little More Time’. The success of the track pushed General Johnson to the front of the group’s sound: his unconvential singing style gave the group an unrivalled uniqueness, and would help them score further hits with ‘You’ve Got Me Dangling on a String‘, ‘Chairmen of the Board‘ and the UK favourite ‘Working on a Building Love‘. Interestingly, the group released the first version of the song ‘Patches’, co-written by General Johnson. Although not a hit for the Chairmen of the Board, it would be a big hit for Clarence Carter in 1970. As the seventies rolled on each of the group’s members would record solo material, although none were as successful as the records they made together. The group spintered in 1976: Kennedy took leave of the group, and after a UK tour Johnson and Woods temporarily retired the group’s name. Just two years later Johnson and Woods reunited and reformed the Chairmen of the Board, recruiting a third member, current bandleader Ken Knox. This new line-up took a different music turn, and started recording beach music, a variant of R&B popular in the Carolinas in America. This trio performed together until the death of General Johnson in 2010, and Woods would leave to form his own group “Board of Directors”, although this was short-lived due to illness. As a result, Ken Knox was left to carry on the musical legacy of Chairmen of the Board. Johnson personally asked Knox to carry on after his death, and Knox is doing just that with new members Thomas Hunter and Brandon Stevens. The new line-up of Chairmen of the Board released an album last year entitled Words Left Unsaid. The album combined the Chairmen of the Board sound with the Philly Soul sound, featuring collaborations with The Steals Brothers (who wrote The Spinners’ ‘Could It Be I’m Falling in Love’) and writer-producer McKinley Jackson, the current musical director for The Temptations. 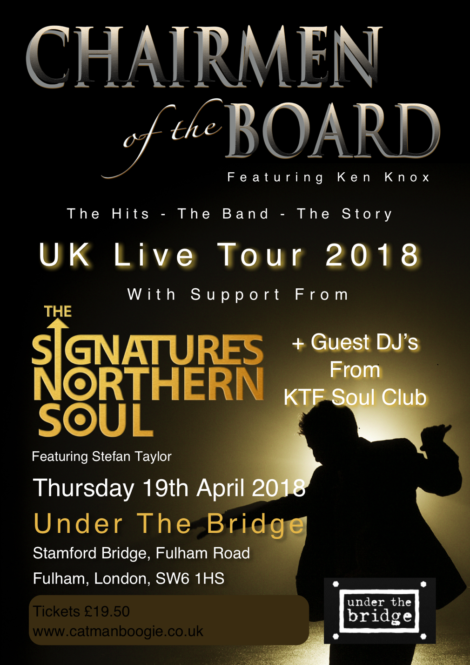 The Chairmen of the Board featuring Ken Knox tour the UK this Spring. You can find dates of their tour and ticket links on their Facebook page here.